Do You Want to Know How to Lose Weight in Your Face? You are in the Right Place! Can You Lose Weight in Your Face? If you want to know how to lose weight in your face, you are in the right place. You might not believe you can dramatically change your physique in a short six months. But, if you see a transformation in a face, you know that you can expect even bigger changes in your body. You will want this picture after investing six months in reinventing yourself. I decided to do that yesterday, so I got a close up, obviously not done by a professional photographer, but you get the idea. The picture taken on the right is 258 days after starting the Fit Apprentice program. If you compare the two photos, you can see the difference in facial structure. Why would I ever want to go back to eating the way I was before the Fit Apprentice? People ask me, don't you miss the white bread, the bagels, the chips, the ice cream , the soda, the snickers, the pasta? Why would I want to go back to the face on the left? By the way, I know my hair looks darker on the left, that is because I had dyed it trying to look better. But my opinion is that the gray looks better with a non bloated face than the dyed hair with a bloated one. 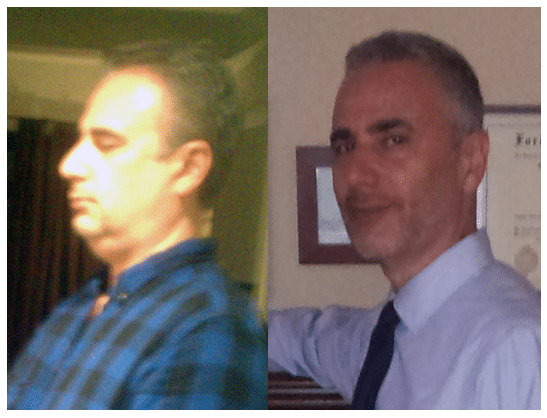 I am posting these face pictures side by side so that you can get motivated yourself to make some simple changes which can have long term positive effects. Start today! Tell us about your progress, we are glad to help! As I mentioned yesterday, I am ‘doubling down' on creating my own news and resisting the urge to read the news presented by the media, and I am having that moment right now, I want to check out CNN, but instead, I am going to write here about the news I want to make today. So, we might as well dream big. On Monday, was max pushup day, and I did 75, and then another 25 to get up to 100. As you know, my goal is to get up to 100 consecutive pushups. So since June 21, 2012, starting at 1, we have made some good progress to get up to 85 which was my max two weeks ago. On Wednesday and Friday, I like to do sets, so far my highest number for a day of pushup sets has been 400. I want to push that to 500 today. So instead of reading the news , I will be doing my pushup sets, tracking them and plan out another workout at the gym later on today of squats, shoulder press and deadlifts. 66 + 56 + 46 + 36 + 50 + 26 + 40 + 30 + 40 + 30 + 30 + 50 = 500!!!!!!! 5 sets of 5 repetitions in Squats using 95lbs. Will go up to 100lbs on Friday. 5 sets of 5 repetitions of Shoulder presses using 65lbs. Very important to keep your elbows in front of the bar…not out to the side, that has been the source of my shoulder pain! and today, it was great! friday will go up to 70lbs. 1 set of 5 repetitions deadlifts using 135lbs. Will go up to 140lbs or 145lbs next monday. For warmup did alot of stretching, shoulder dislocations…will have to make a video for ya! I will keep filling the numbers out as the day goes by. I know it is a bit late, but what are your new year resolutions? We are not that far into 2013, the first quarter still has a few weeks to go. I can start off with mine, I have an idea that you know what they are. I would say I have 2 big ones right now, one is to , as embarrassing as it is to admit, to stop nail/cuticle biting. I have that nasty habit from when I am a kid. It is just wrong to wear a James Bond suit and skinny tie without the hands to go with it! So, truth is that I started yesterday. And so far, so good, I have not done any biting…yes, I know the only popular biting done these days is by vampires, but unfortunately I have been doing it to myself for so long. Every anxiety or even celebration, I have done it. When I really get them looking good, I might show the before and after, or I will have to show it if I write an ebook of how to stop! I do not have a special strategy here other than awareness. Staying aware that I am giving my hands a rest, leaving them alone, letting them be more productive than making them bleed. Yea, gross! I am also growing a little beard so I can keep my hands busy, and if I have alot of anxiety, then I will just rub the beard like a genie and try to make my wishes come true that way. The second is falling to sleep at a normal hour. I am not sure how I will go about that either, but I have to find a way, and committing to it here seems like a good enough way to put the pressure on myself to follow through. Wish me luck! In the meantime, how about letting us know what you are doing today? What are your goals for Q1 of 2013? I would also like to get someone else's before and afters to post up on top of the Fit Apprentice to inspire others. 730pm Update: I have not read the news once. I have no clue which country is blowing up or which economy is tanking. I have no idea who is to blame today for the sequester, the schmester and the village jester, good! I am glad I don't know. I have been able to stay more focused on working out and studying which seems more productive to me. I just caught myself as I started to go in for some nail biting, and came back to you all instead. Instead I am looking into how to write a good pdf, I would like to put the main principles of the Fit Apprentice down and make it available as an ebook/guide/report, whatever we will call it. Now I am going to get ready to head to the gym and do my 2nd workout of the week. My plan is to do squats, shoulder press and deadlifts. I will watch some videos regarding proper form, especially for the shoulder press, since my left shoulder is always killing me when I do presses, there must be a way to fix that? !